Replacing the fairly short lived Thai restaurant Issan Thai Street Food, Cô Thư Quán (pronounced 'Go Tu Quan' or 'Miss Thu's Restaurant') has a menu with a diverse range of street food and cuisine from across Vietnam. In December 2016 the first incarnation of the restaurant had to close after the fire in the Little Saigon Market. Inside little had changed since the previous occupants in terms of the fit out, we ended up seated in the back section. We kicked off with some prawn spring rolls, which were on the skinny side but had the expected crunch and flavours. 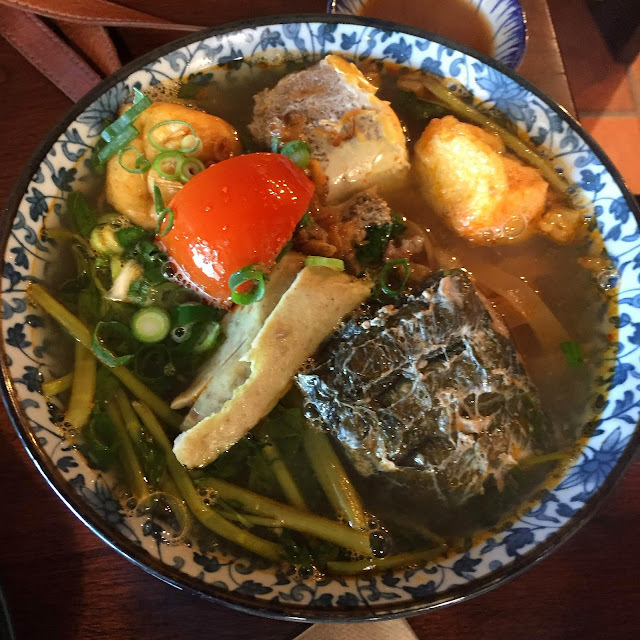 Th Bun Mam or Fermented fish noodle soup had a murky brown broth flavoured with fermented anchovies and fish sauce along with cat fish, pork, eggplant, fishcake, prawns and a topping of chives. The combination of flavours was full on and I mixed in condiments to get something I enjoyed. The Bang da cua Haiphong or Haiphong red rice noodle crab soup was also packed with a variety of ingredients and flavours. The bill came to $37 and the service was friendly and fairly quick. I'd be happy to try some more of the dishes on the extensive menu on another visit.